Nuts in general and Almonds in particular are now recognised as one of the healthiest foods, and growing your own means you can be sure the nuts are as fresh as possible. Almonds have high levels of vitamin E, and contain chemicals thought to be associated with lowering cholesterol levels. Ingrid is the most reliable Almond variety for the UK climate, and will produce well-flavoured almonds in late August if you can offer it a sunny sheltered situation. The spring blossom is also very attractive - far more so than most fruiting plums and cherries, to which it is closely related. Cropping is light but it makes an interesting and unusual addition to the home orchard. Please fill in the details below and we will let you know when Ingrid almond trees are back in stock. Ingrid is self-fertile and does not need a pollination partner, although fruiting may be improved if there is a compatible tree of a different variety nearby. Plant in the sunniest and most sheltered spot you can find. Ingrid is self-fertile so no pollinator is required. 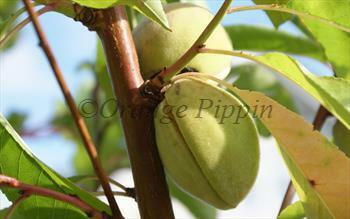 However cropping will be better if there are other almond trees (of the same or different varieties) nearby. Ingrid is reasonably resistant to leaf-curl (similar to peach-leaf curl) which is a common problem with almonds. Ingrid is a reliable cropper but it flowers very early in the spring - poor spring weather is the main limiting factor on successful almond production in the UK. Most of our Almond trees are grafted on the St. Julien plum rootstock, and will reach and after 10 years will reach a height of 3m-4m (10ft - 14ft). Cropping usually starts when the tree is about 3 years old. As with plum trees (to which they are related) it is best to keep pruning to an absolute minimum. Almonds are closely related to plums - an almond is essentially a plum where you eat the nut inside the stone, rather than the flesh. Almonds are thought to have originated in western Asia. They are grown commercially in southern California, Spain, and Italy - and are well-suited to the Mediterreanean climate.